Some pictures of Amy McClellan’s annual garden quilt show. This quilt was made by Xenia Stirland and just won the recent Riley Blake challenge. Here’s a close-up. The detail and the quilting on this one were amazing. This gorgeous applique was made by Judy Fitzgerald. I love this vintage reproduction quilt made by our friend Pamela of French Knots. This is a close-up of another one by Pamela. I love it too! It just looks scrappy and old and it’s in one of my favorite color schemes. My full-size photo was blurry, but it’s fun to look at the fabrics and the detail here. Love the Chicken Little in Sandy Klop fabrics. This was made by Diana Long. Love the 3-D detail on this laundry quilt. Pattern for this one here. Perfect night for some scenery, quilts, and ice cream. That Laundry Day quilt is amaaazing! And so are all of the others. Thanks for sharing. What a fun place to display all the quilts. I love Pamela&#39;s quilt. Thanks for sharing them! Wow! What a bunch of wonderful quilts! I&#39;m always amazed at how creative people are, and the time involved in creating those kinds of masterpieces! Thanks for sharing pictures with us. Great setting!! I can just imagine that fall evening in Utah. What a gorgeous place for a quilt show! Thanks for sharing! Lovely inspiration and such variety. Beauty comes in many colors and patterns.<br />Thank you for sharing. The quilts are beautiful! What a day. Thank you for sharing pictures! Gorgeous quilts! Thanks for sharing. Thanks Amy for the shout out. Your so sweet. I loved your halloween quilt. How beautiful this is! And what a good idea to display the quilts in the garden, together with the nice colorful flowers. Thank you for sharing! Really nice and thanks for sharing. Am I correct in guessing that you are addicted to Halloween prints like I am? The quilts are great and so is the setting for the show. This is a wonderful idea. Wow they&#39;re all so pretty :)<br />Looked like a gorgeous day too! Amazing quilts in a perfect setting – thanks for sharing! I loved seeing all of the quilts. They were all great. The Riley Blake one with the houses was wonderful. I love anything miniaturized including quilts, so the the little dresses on the laundry day quilt blew me away. Thanks so much for sharing. Wonderfull!!! So many beautiful quilts… Wish I could see it in real. <br />Thanks for showing it at your blog. What a perfect setting for a quilt show. Gorgeous quilts and beautiful garden!! So glad you shared them with us! Is this here in Utah?? Where does it take place? I would LOVE to attend!! 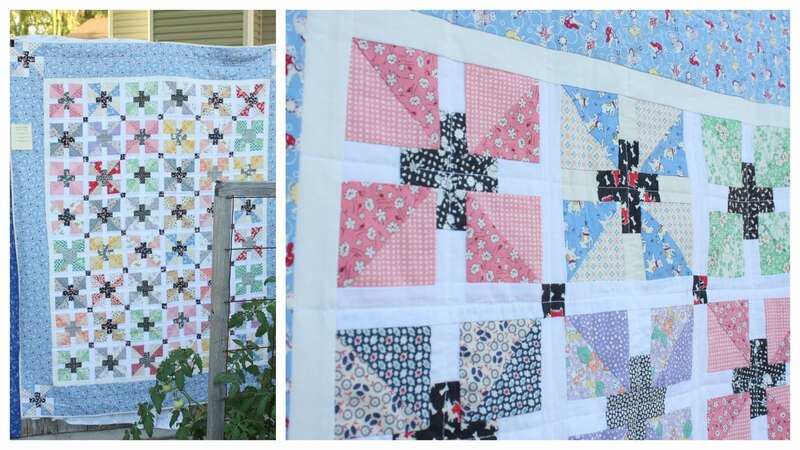 What beautiful quilts and scenery!Love the laundry quilt ~ thanks for sharing – no betty way to start out the morning! Great great show. Amy&#39;s garden party is always full of fabulous quilts. oh, how i miss american quilting! I miss the classes, the garden show, the saturday sampler. I especially miss those beautiful mountains. thanks for letting me live vicariously through your garden party photos. Beautiful stuff. Wow! just stumbled onto your blog!! What beautiful designs. Fab! What a great show. Would have loved to be there, so near and yet so far. Thanks for sharing this. People never cease to amaze me. Wow. What a beautiful quilt show! Thanks so much for sharing. I love quilt shows, especially those in an outdoor setting! What a lovely day that must have been enjoying so many fun and beautiful quilts. Thanks for sharing. WOW, what a show! I especially love the 3D laundry quilt!